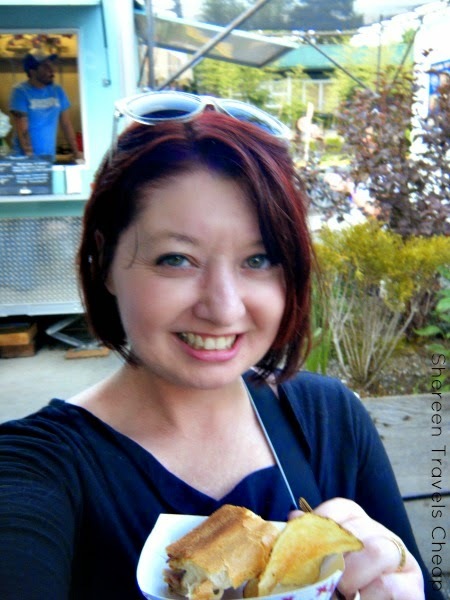 It's no secret that I seek out food trucks and carts wherever I go, but I usually only eat at one a day. 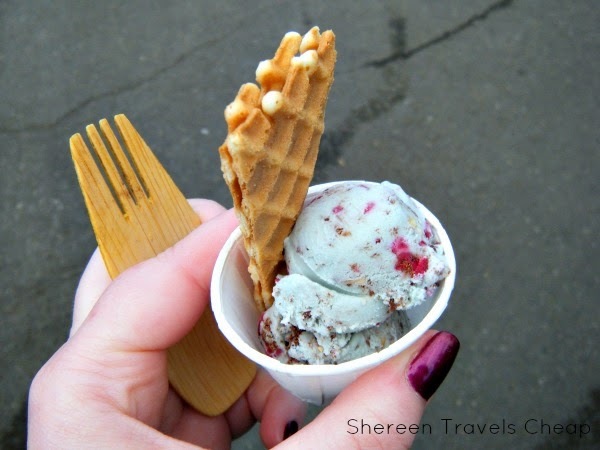 This week I attended Portland's annual food truck festival, Eat Mobile. This has become a regular outing for me each April, because I don't often go across town to eat, and when I do, it's usually because I've got a specific restaurant in mind or I'm antique shopping. 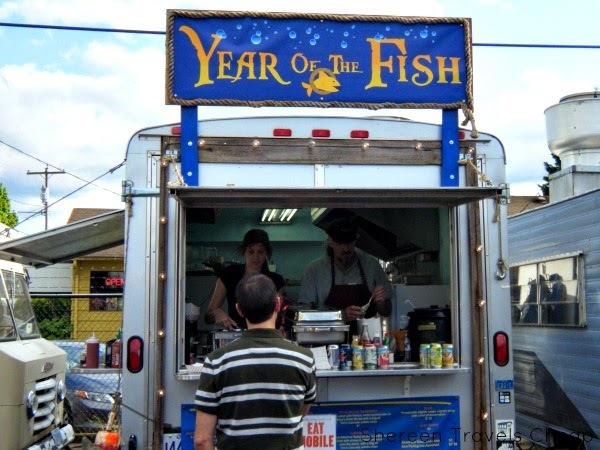 Portland is widely known as being a top destination for food trucks, and there's hardly anyplace in the city where you won't find one or two. 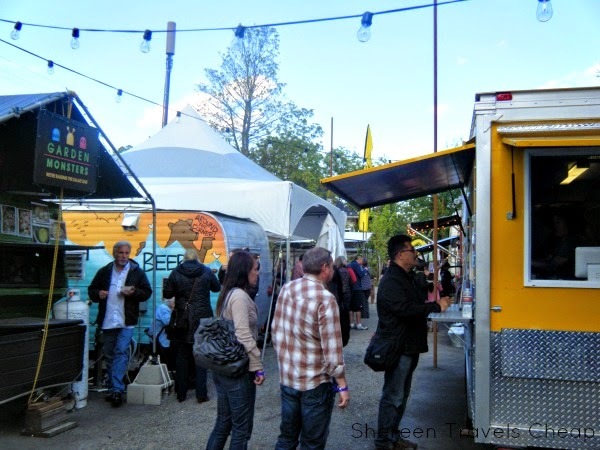 We have food cart pods where many congregate and you can choose from a variety of yummy foods all in one place. It's fantastic. So, like in years past Eat Mobile brings people to the trucks, though this year is the first time they've done so literally. Two large pods were involved and shuttles ran between them instead of moving them all to one big parking lot as before. Unfortunately, I feel like this caused them to raise the price to where it may not have been worth it, as there were half as many carts as well. Not all the carts in each pod were participating either, so you had to navigate around people who were there buying dinner and look for the sign on the carts that were actually giving away samples. The samples were larger this year, but that just made it harder to try everything, because we were stuffed by the time we were 2/3 of the way through tasting, as everything came with a carb of some type. The good thing about the new structure this year is that there was a lot more variety (not all the same trucks from before), there was more seating and there were waaaaaaaaaaaay shorter lines. Your admission also included two drink tickets which it didn't in the past. You paid for beer and any other drink you wanted, unless it was Vitamin Water, which was a sponsor. I, eventually, purchased a water, but I did have beer from a local microbrewery. There were fewer tickets sold and the event took place on a Wednesday evening instead of a Sunday afternoon, which made it feel a bit more intimate and less like a cattle herd. 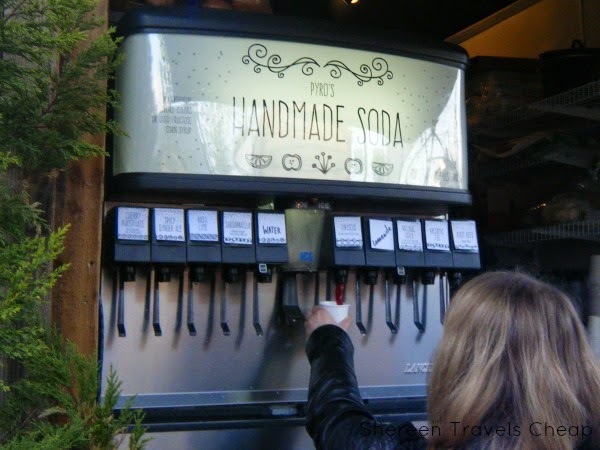 I didn't have to wait 30 minutes for a sample of ice cream or a slider, but there was also the absence of some of my favorite carts like La Creperie and Soup Cycle. Obviously, there wasn't room for many extra carts in the already packed pods if any chose to participate and move for the evening. Enough about that, let's talk about the food! 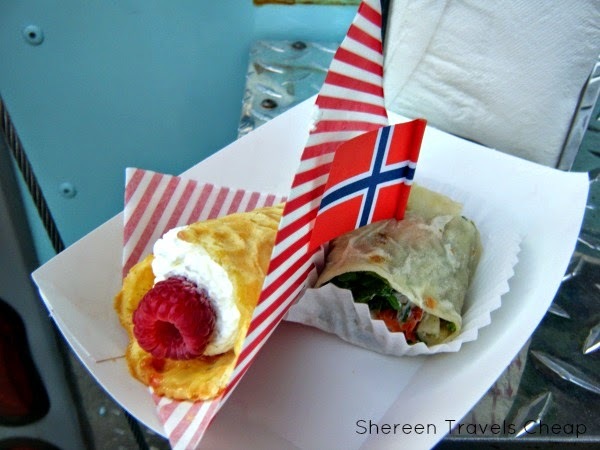 Though there were quite a few American food trucks, there were a lot of ethnic foods, which I felt were lacking from the event in the past. 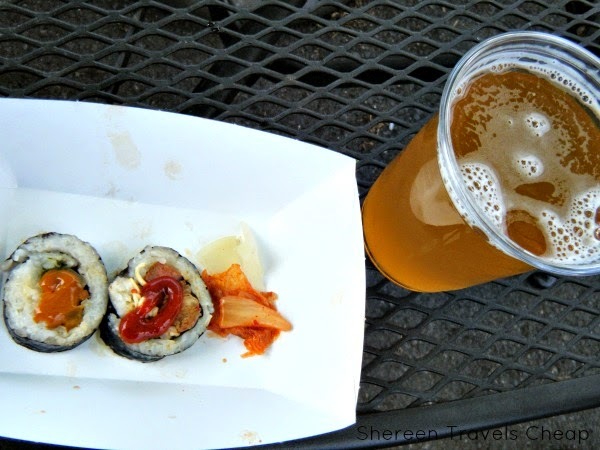 I enjoyed a tiny slider and hot dog with pulled pork on it, but I also tried kimbap, which is a Korean street food that seems a lot like sushi, but is full of cooked meats instead of raw fish. So good! I had some fantastic vegetarian Thai curry which was super spicy, a huge dish of tiny beignets with raspberry syrup (basically a bowl of bread that I probably should have split with my friend and also not started the event with), some really yummy cod nuggets and even ice cream dubbed The PDX Carpet that debuted at the event to celebrate Portland International's signature carpet getting replaced. The ice cream had just about all the ingredients in it: cranberries, hazelnuts, peppermint and dark chocolate stracciatella. 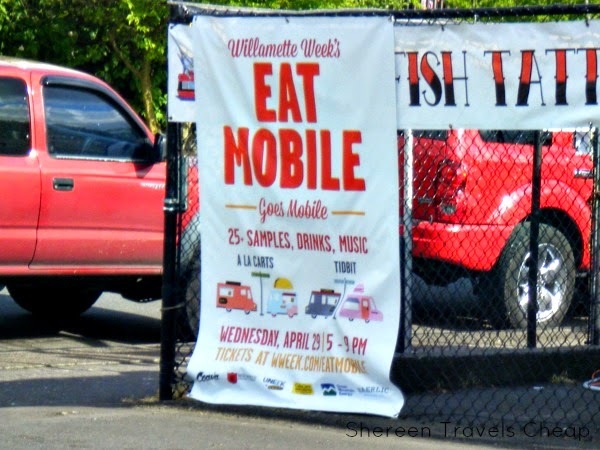 I encourage you to check out Eat Mobile if you're ever in Portland in the spring. You can find more details here. Quite a few people make plans to visit specially for the event. Many come down from Seattle and some from Vancouver, BC. They offer restaurant quality food for a fraction of the price - You don't pay for the huge overhead they have at traditional sit-down restaurants. They don't have waiters, big energy bills, busboys, etc. Food truck food is now much more upscale than it used to be - You can just as easily get a steak as you can a hot dog nowadays. Everyone gets what they want - No need to search for a restaurant that will satisfy your whole group - sometimes my husband and I don't agree on food either. If you find one food truck, you're likely to find several, so not everyone has to eat the same thing. No reservations needed - Walk up, order, get your food, take it and eat it on your way to your next tourist site or sit in the nearest park to enjoy it. Time saver! Food is affordable, because it's made with local ingredients - 'Nuff said. 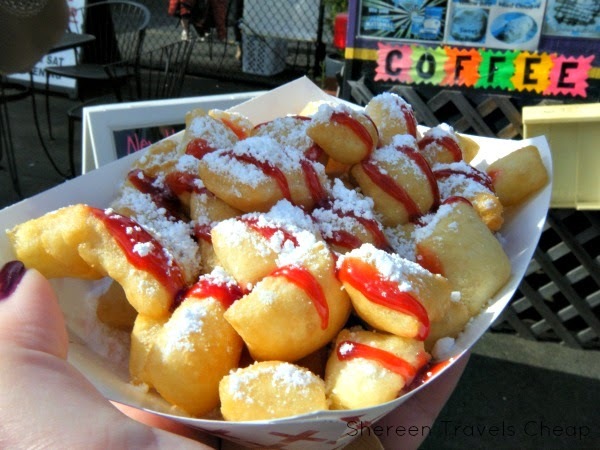 Obviously, there are many more reasons food trucks are awesome. I know a lot of folks who've never eaten at one, but they can be addicting. Eat at one and you'll be itching to find more to try. 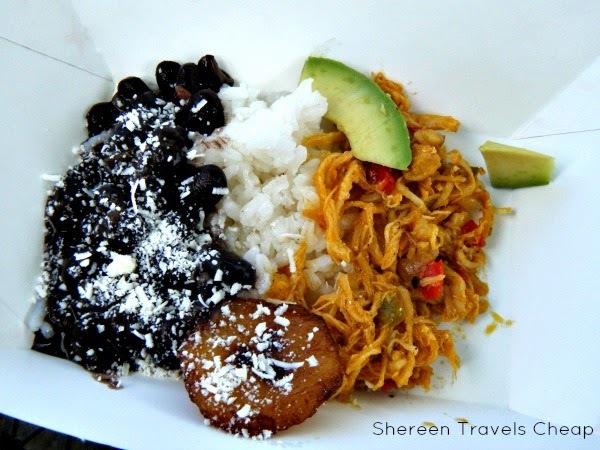 Where have you found the best food trucks or street food in your travels?